The actor Ichikawa Raizô I held the name of Ichikawa Masuzô I from the 11th lunar month of 1753 to the 10th lunar month of 1761. A minor katakiyaku actor held the name of Ichikawa Masuzô in Kyôto from the 11th lunar month of 1767 to the 5th lunar month of 1778. No record afterwards. He was not considered as an official holder of the name. The actor Ichikawa Raizô III held the name of Ichikawa Masuzô II from the 11th lunar month of 1779 to the 10th lunar month of 1788. 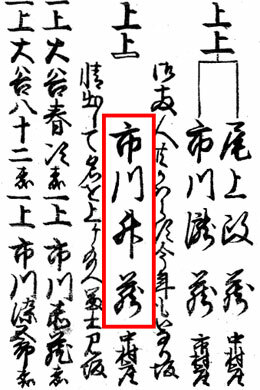 A minor katakiyaku/jitsuaku actor held the name of Ichikawa Masuzô in Ôsaka between 1789 and 1801. No record afterwards. A minor tachiyaku actor held the name of Ichikawa Masuzô in Kamigata between 1814 and 1820. No record afterwards. Dates of birth and death unknown. Disciple of Ichikawa Danjûrô VII, he started his career in the 11th month of 1800 in Edo at the Ichimuraza, where he made his debut on stage (hatsubutai) under the name of Ichikawa Yonezô II. He took the name of Ichikawa Kodanji III in the 11th month of 1816 at the Kawarasakiza. He took the name of Takigawa Danjûrô in the 1st lunar month of 1821 at the Nakamuraza. He took the name of Ichikawa Edohei in the 3rd lunar month of 1821 at the Nakamuraza. He reverted to the name of Ichikawa Kodanji III in the 1st lunar month of 1822 at the Ichimuraza, performing in the kaomise drama "Gohiiki Tsuwamono no Majiwari", which welcomed back Iwai Hanshirô V in Edo and celebrated the shûmei of Nakayama Kinsha. 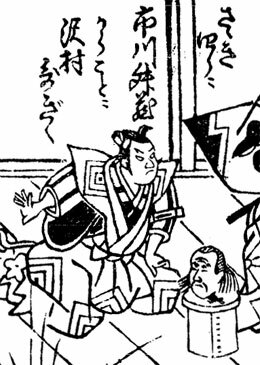 He took the name of Tsuruoka Hachizô in the 5th lunar month of 1824 at the Ichimuraza, playing the role of Zenta in Tsuruya Nanboku IV's drama "Ehon Gappô-ga-Tsuji". He took the name of Ichikawa Hachizô in the 11th lunar month of 1826 at the Ichimuraza, performing 2 roles in the kaomise drama "Ise Heiji Shô no Kaomise". He finally took the name of Ichikawa Masuzô III  in the 11th lunar month of 1827 at the Ichimuraza, performing in the kaomise drama "Kawaranu Hana Genji no Kaomise". His last-recorded performance in Edo happened in the 3rd lunar month of 1833, at the Kawarasakiza, where he played in Tsuruya Nanboku IV's drama "Sumidagawa Hana no Goshozome". No record afterwards. He was a tachiyaku or katakiyaku supporting actor, who was equally at home in sewamono and jidaimono dramas. A minor katakiyaku/jitsuaku actor held the name of Ichikawa Masuzô in Kyôto between 1839 and 1841. No record afterwards. A minor tachiyaku actor held the name of Ichikawa Masuzô in Kyôto between 1848 and 1856. No record afterwards. Born in 1857. He was the son of a shibai jaya owner named Yoshiwara Hanki. Disciple of Kawarasaki Gonjûrô I, he started his career in 1864 and his first stage name was Yamazaki Hôsaku. He took the name of Ichikawa Masuzô III in March 1880 at the Shintomiza. He passed the nadai exam in April 1901. He died the 6th of June 1906. He was the father of Ichikawa Masuzô IV. As he was very knowledgeable in Kagura, he was nicknamed Gedômasu . Born the 2nd of February 1897. Son of Ichikawa Masuzô III, he started his career as a disciple of Ichikawa Danjûrô IX, who gave him the name of Ichikawa Kimitarô. He made his debut in April 1902 at the Kabukiza. He passed the nadai exam in 1922 and took the name of Ichikawa Masuzô IV in June 1922 at the Imperial Theater, playing the roles of Ôwashi Bungo and the monk Masubô in "Kanadehon Chûshingura" and "Kappore". He settled in 1928 in Kamigata, where he performed with Nakamura Ganjirô I. He stopped acting for a while at the end of WWII. He was back on stage in May 1957, when he became disciple of Ichikawa Ebizô IX. He performed in April 1962 at the Kabukiza along with his master, who took the name of Ichikawa Danjûrô XI. He also played the role of a farmer for the revival of "Fudô" in November 1962 at the Kabukiza. This was his last performance under the name of Ichikawa Masuzô IV as he angered his master in 1963 over a trivial thing. He had to give up his stage name and he became a free actor. With the support of Onoe Shôroku II, he took the original name of Tonegawa Kinjûrô  in September 1963, playing the roles of Hayami no Tôta and Ushizô in "Torii Mae" and "Fundoshi Isha". Kinjûrô was also chosen by this facetious actor for its similarity with Danjûrô. His new yagô, Murasakiya (the Purple Guild), was related to his favorite colour. He appeared on stage for the last time in February 1983 at the Kabukiza, where he played the role of the role of the kamikuzuya Borohachi in the drama "Shisen Ryô Koban no Ume no Ha". He retired and died the 22nd of January 1985 . 4 generations but 5 official holders of the name as there were two Ichikawa Masuzô III according to the latest edition (2012) of "Kabuki Haiyû Meiseki Benran". 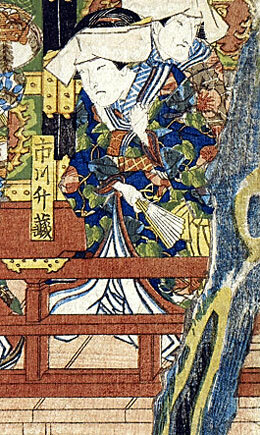 Recorded as Ichikawa Masuzô II in Nojima Jusaburô's book "Kabuki Jinmei Jiten". Gedô is a famous type of mask in Kagura. We have to explain that Tonegawa is the Tone River, which flows near the cities of Narita (the origin of his former yagô) and Ichikawa (the family name of his former master). A few months before the shûmei of his former master's son Ichikawa Danjûrô XII.